If you are not satisfied with your Sharper Image purchase within 60 days, you can return it for a replacement or refund. 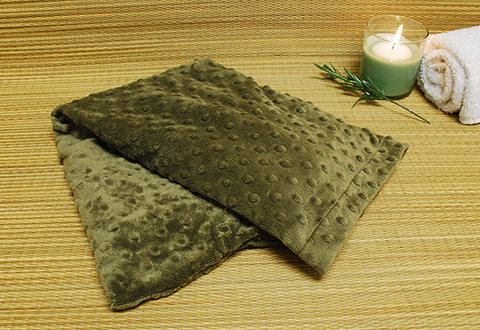 Rest, relax and take the chill off with the Heated Luxury Spa Wrap. Simply warm it in the microwave, then drape it around your shoulders or lap for cozy heat and stress-melting aromatherapy. Or, chill it in the freezer for invigorating cold therapy. Remove the flaxseed insert to machine wash. Available in Green/Eucalyptus. Free Shipping on Orders Over $99! Use Promo SHIP99 in your Cart. The Heated Luxury Spa Wrap helps you relax and warm up with gentle heat and the soothing scent of Eucalyptus. • Warm in the dryer, microwave or towel warmer. Warm, don’t cook! Microwave 30 seconds for small items, a minute or two for larger wraps. Item becomes warmer as it’s worn. PLEASE NOTE: This is a personal care item and is returnable if in its original unopened packaging and unused condition. WARNING: This product may contain a chemical known to the State of California to cause cancer or birth defects or other reproductive harm.